Baker Mayfield and the Sooners have overachieved. College football can feel like a hopelessly deterministic sport sometimes. In this week’s preseason AP poll, for instance, it was revealed that the recruiting machines at Alabama, Ohio State, Florida State and Southern Cal are also the top favorites to win the College Football Playoff. Ho-hum. To get a sense of which teams have gotten the most — and the least — out of their talent, I took ESPN’s Football Power Index (FPI) ratings for each FBS program over the past two seasons,1 and plotted them against 247Sports.com’s Team Talent Composite scores. (The latter measures a roster’s strength by tracking how many highly touted prospects a team has at its disposal.) The overall relationship between FPI and roster talent is relatively strong — recruiting scores explain about 65 percent of the variation in team performance — but some teams have managed to rise above college football’s penchant for predestination. 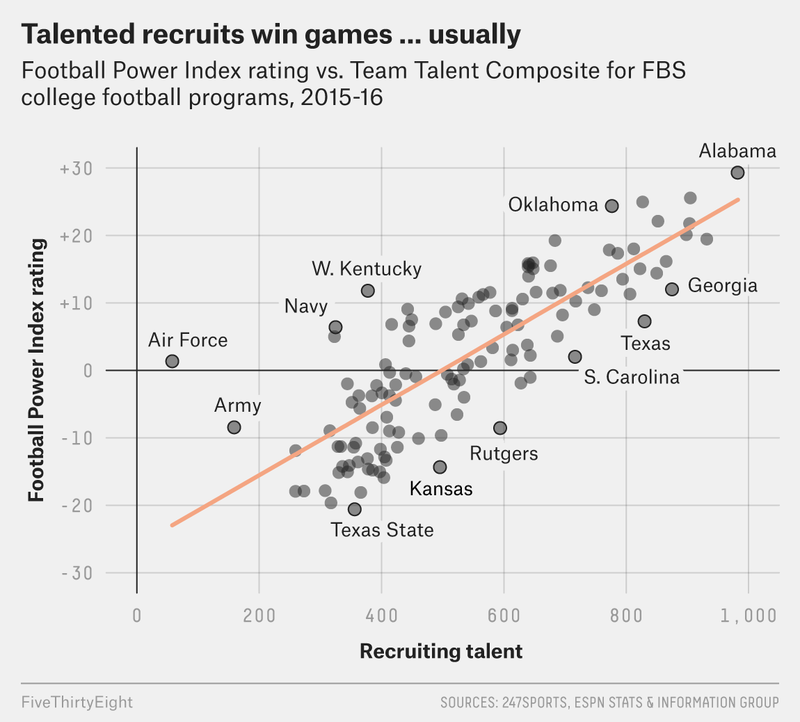 I mentioned the service academies — Air Force, Navy and Army — because they are the biggest outliers here. Although their recruiting process works largely the same as at other schools (with the biggest exception being a lack of scholarships specifically for athletics), they face unique barriers to hauling in top talent, including mandatory military service after graduation, tougher academic requirements and even size restrictions for incoming players.2 That’s why, according to the Team Talent Composite, the academies are mostly filled with players who were lightly regarded coming out of high school. But whether because of their emphasis on character and discipline, or just their predilection for triple-option schemes that can trip up the most formidable defenses, these programs have produced far better results than their talent would suggest. Among Power Five schools, the top outperformers are a generally unsurprising collection of well-coached programs, such as the perennially overachieving Wisconsin Badgers, the Washington schools (both UW and WSU), plus Bill Snyder’s K-State and Mike Gundy’s Oklahoma State squads. But ahead of them all might be a surprising team: the Oklahoma Sooners. OU got a reputation for losing big games under former coach Bob Stoops, but Stoops probably should have also gotten more credit for putting the Sooners in position to play those games in the first place, given the way they outplayed the expectations of their recruiting classes. Meanwhile, at the other end of the spectrum, there are programs that recruit like crazy but achieve only modest outcomes, like South Carolina, Texas and Georgia. The latter two in particular are storied programs that recruit off of their prestige, but both teams have found a way to mess up that advantage in recent seasons. There’s also no shortage of teams that field average talent but manage to be awful anyway, like Kansas and Rutgers. All of these schools serve as testament to the importance of coaching and player development in any program’s fate. Although a team like Nick Saban’s dominating Alabama squad can be No. 1 in recruiting and No. 1 in performance on the field, most schools have to make the best out of what they’ve got. How much bang does your favorite school get for its recruiting buck? Find out in our searchable table below. Ideally, we’d be able to look at this over a longer timeframe, but the data I’m using for this story only goes back to the 2015 season. Guidelines for weight and body fat, for instance, can make it difficult for top linemen to qualify.